For an all purpose stick rod, I prefer 6011 rods over 6013. It seems that most folks like 6013 better. even though 6013 rods weld smoother and the weld beads are prettier, I prefer a rod that will get the job done in a variety of situations over a rod that will make a pretty weld every time. 6011 rods weld all positions and all directions...uphill and downhill both can be done...downhill welding is no problem....sometimes, when you weld with downhill with 6013 rods slag runs ahead of the puddle and causes problems like slag inclusions and wormholes. 6011 electrodes have an aggressive arc and burn thru mill scale, rust, or paint. 6011 stick rods will work on most of the small inverter stick welders where 6010 rods will not. 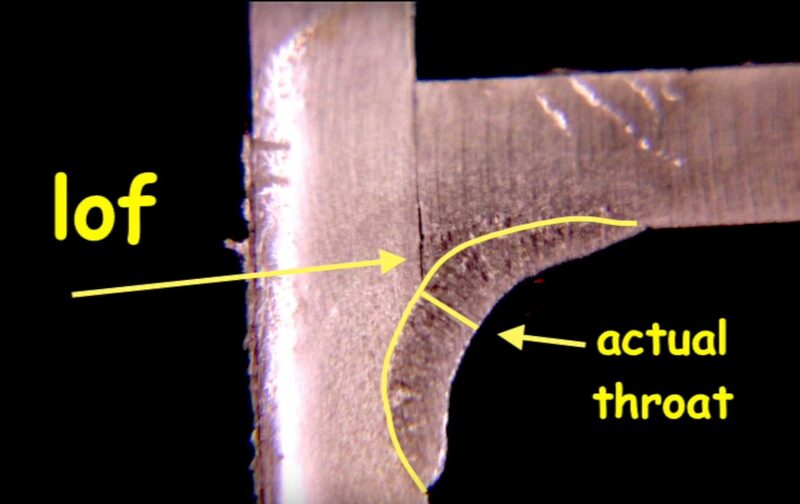 Just because 6011 rods weld downhill does not mean there are no limits to what thickness you can weld. There are limitations to everything. I decided to test some welds in both 1/8" (3.2mm) thickness and 3/16" (4.8mm) thickness and the results were eye opening. The 1/8" rod on 1/8" thickness did ok but using 5/32" (4mm) 6011 on 3/16" (4.8mm) thick material was a different story. The biggest problem was the concavity of the fillet weld. the weld looked ok but when I measured the throat of the fillet weld it came up short. And when I did the cut and etch test, it revealed an actual throat size that was surprisingly thin. 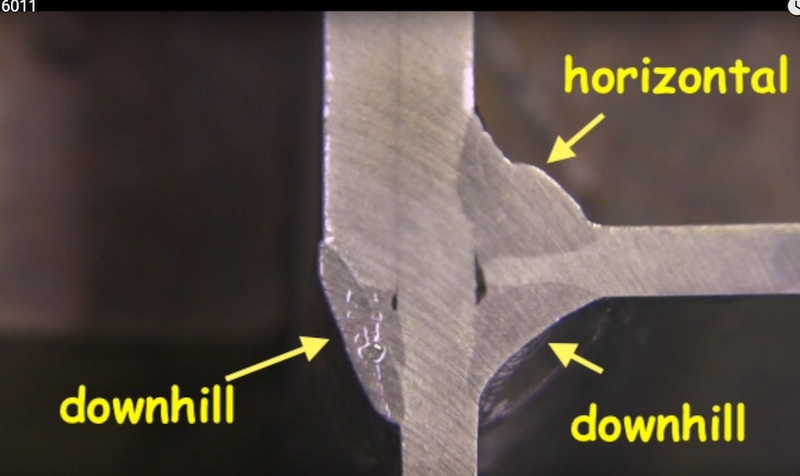 Downhill welds are typically much more concave than uphill welds. Not a problem for thinner metals but trying to get a sound and strong weld on 3/16" thick metal going downhill might require 2 passes. The cut and etch test results would seem to indicate that for metal thicker than 1/8" uphill welding is a better choice. There are exceptions to every rule and I think the 3/16" metal could be welded using 1/8" rods for the first uphill pass and then a filler pass using 5/32" rods could be done to achieve both penetration and adequate fillet weld size. This is why I like to test welds. Its very enlightening and provides a good feel for what is actaully happening in the arc. Just to be clear, some welds are required to be done using a WPS (welding procedure specification) and there is no choice as to welding uphill or downhill....and in those situations, the electrode would be specified as well and you wouldnt necessarily be able to choose 6011. But there are still those welds that are done to get a conveyor belt up and running where a quick downhill pass with 6011 is just what is called for.